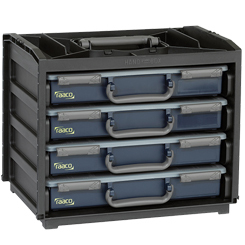 RAACO Storage solutions provide you with the organisation that is so sorely needed in DIY, as well as any task, project or profession that may require the use of tools and generally getting your hands dirty. Particularly easy to build, hard-wearing and practical, a RAACO product is perfect for sorting out your van, garage or shed - letting you make sense of chaos and saving you time in the process. Whether a cabinet, a tool box, some shelving or an organiser (as well as a great deal more), each RAACO product benefits from the brand's decades of experience in the field, and they have earned numerous awards for their outstanding achievements in industrial design. So wide-ranging are the items available, they allow for the complete customisation of your space, providing you with the ease of access that you need for a smooth, safe and satisfactory job. Fully crash tested, environmentally responsible and incredibly durable, RAACO storage solutions are the ones you have been waiting for. Whether you simply need a tool belt or a screw organiser or you're going for a complete rethink and redesign of your space, they are the perfect place to start.